My class began their American Symbols and Monuments unit last week, with learning about Abe and George. It is one of my favorite units to teach. This week we will learn about Mt. Rushmore. I have compiled some resources that I use in my classroom that maybe useful to you as well. There aren’t a whole lot of Mt. Rushmore books out there, but I have found a few. Here are some books that I use when I teach about Mt. Rushmore. Here is a good youtube video that shows a little about the history and how it was built. I prepped our close reads and interactive notebook pages for Mt. Rushmore. The patriotic words list was added a list to their “littles” word rings. They get so excited when there is a new set of words added. It’s a great way to build vocabulary and expand their writing. And last, if you go to the Mt. 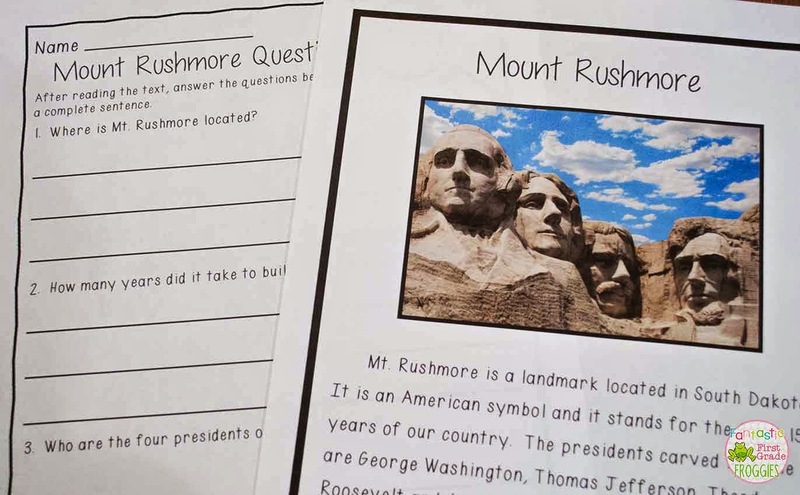 Rushmore National Park website, they have a student guide and some lesson plans on geometry and Mt. Rushmore. I may try out one of the geometry ones this week. Do you teach about Mt. Rushmore? What are some of your favorite resources?